Together, We Protected the Monarch Butterfly Habitat! Monarch butterflies thrive at this 63-acre property. This picture was taken at the property in 2015. Help us protect this special sanctuary for butterflies! The call went out three weeks ago: who can help protect a remarkable Monarch butterfly habitat for future generations? The parcel of land in Ohio County was scheduled to be auctioned off, likely for development. We aimed to protect the land as a natural area forever…but we needed to raise $250,000 in just three weeks. Community support fueled our effort. Over 100 families, individuals, organizations, businesses and foundations chipped in to help purchase the land. Donations ranged from a few dollars to thousands of dollars. You also helped spread the word to your family, friends, and other Monarch lovers. Your contributions were matched 4:1 by a private donor, and together we reached the $250,000 mark on Monday, Dec. 18, just in time for the auction. On Tuesday, Dec. 19, we successfully bid on the property. The auction was a real nail-biter. For almost two hours, we bid and counter bid. In the end, we purchased the property for $245,000. 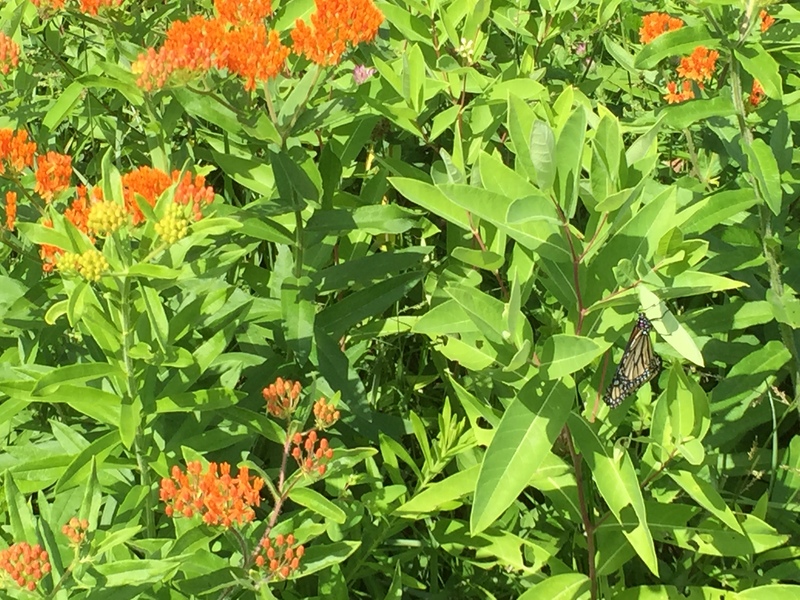 We protected the core habitat that we were aiming for the – the place where Butterfly Weed and Milkweed grow in vast swaths – as well as adjacent land that will help buffer and protect the core Monarch habitat. Monarch butterflies migrate through the Midwest each year, and they need a few specific things to survive along the journey. First, they need native flowering plants like Butterfly Weed that provide nectar for them to eat. This food source is critical to their long migration. Second, they need a place to lay their eggs. Monarchs only lay their eggs on milkweed plants. The migration includes multiple generations, so they have to have places in Indiana and throughout their flight path to raise a new generation of butterflies. 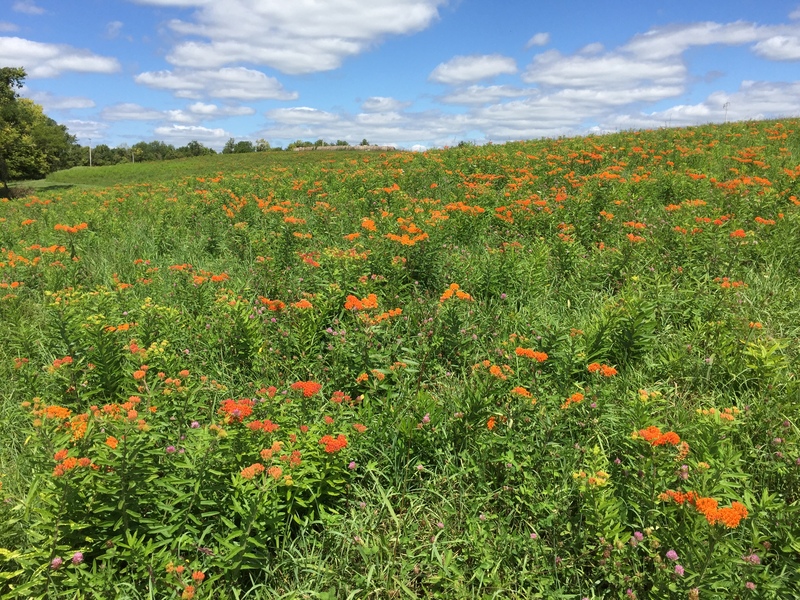 The property in Ohio County hosts an ideal combination of has large patches of Butterfly Weed, a source of food for the adults, and milkweed, where Monarchs can lay eggs and caterpillars can thrive. All told, Oak Heritage Conservancy protected 78 acres of land. The area will be protected as a natural area that’s open to the public and critical for Monarch butterflies. We are already talking with neighbors about where we might position walking trails on the property, and community groups have already expressed interest in visiting. Oak Heritage Conservancy has now protected over 800 acres of land throughout southeast Indiana. To learn more about our nature preserves, click here. A few pictures from the 78-acre Monarch butterfly habitat that we just protected in Ohio County. Click here to become a member of OHC and help protect special places like this Monarch butterfly habitat.